April marks the transition from the yin-like energy of winter and spring to the yang and more active energy of summer. It is a time to prepare for the expansion, outwardness and excitement of early summer, and the fire element which governs it. This workshop combines the healing powers of yin yoga, sound therapy and five element acupuncture to prepare the body and mind for the season ahead. You will receive an overview of the Five Elements from a Chinese medicine perspective, and advice about how to prepare for the time of year. You will then be guided through a nourishing yin yoga practice against a backdrop of binaural beats to bring the body into a deeply relaxed and meditative state. This will be followed by an hour long sound journey using a variety of instruments including Tibetan singing bowls, tuning forks, rain sticks, ocean drum, buffalo drum, steel tongue drum and voice. During the sound journey you can receive spirit point acupuncture*. *The spirit point corresponds with the third eye chakra. It is a deeply relaxing point located in between the eyebrows. You can choose to opt out of receiving acupuncture as part of the workshop. Michelle Cade is an Ayurvedic Abhyanga Massage therapist, sound therapist and composer. Mind Like Water Wellbeing is Michelle's massage & sound therapy practice, personal transformation & inspiration hub. Fascinated with healing frequencies, personal transformation and optimal wellbeing; she uses a blend of sound, scents, lighting and natural beauty as part of her holistic approach to create the ultimate relaxing experience. 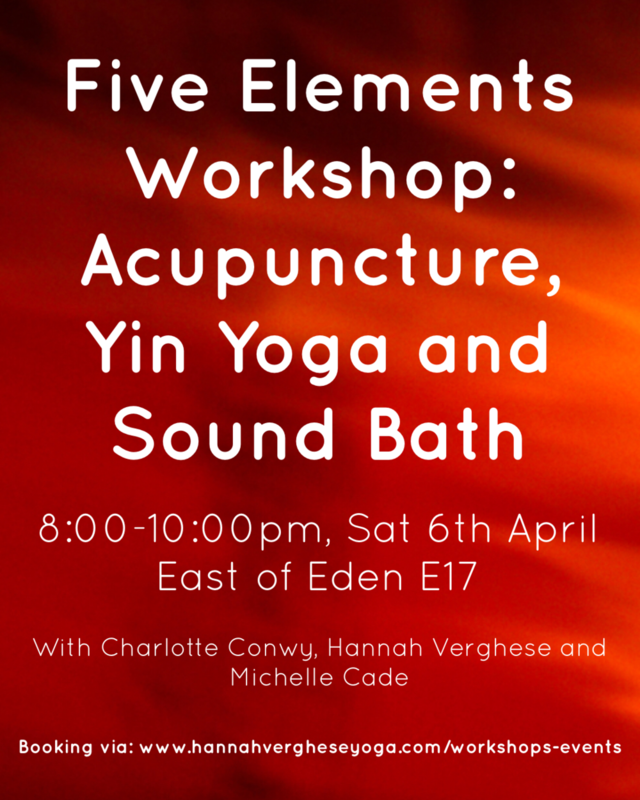 Charlotte Conwy is a five Element acupuncturist and runs her clinic Acu:East as well as practicing within The City, North and East London. She holds a degree and has trained extensively in both Traditional Chinese Medicine and Five Element Acupuncture. She specialises in pain relief, women’s health & fertility, emotional wellbeing and stress management. Hannah Verghese is a yoga teacher and thai yoga Massage therapist. She specialises in working with people experiencing stress and anxiety. She draws on her ongoing studies and exploration of yoga, meditation, somatic movement practices, and of course thai yoga massage to inform her teaching. Hannah is a long standing yin yoga practitioner and a student of Bernie Clark. Teaching yin yoga to others is one of her greatest passions and she describes the yin practice as one of “returning home to your body, and to your self”.